On Wednesday, New York Giants wide receiver Odell Beckham lost his appeal for his 1-game suspension by the NFL. Beckham was suspended without pay on Monday until December 28 due to “multiple violations of safety-related playing rules” in last weekend’s game against the Carolina Panthers. Beckham is not allowed to interact with the team during the suspension and will miss Sunday’s game against the Minnesota Vikings. “I owe some people an apology. I wasn’t raised to act like I did the other day. I am not here to make excuses for my conduct. This isn’t about anything that was said or done to me. This is about my behavior, and I am responsible for my behavior. People expect better from me, and I expect better from myself. “First of all, I apologize to the organization I represent, the Giants, and our ownership, John Mara and his family and Steve Tisch and his family. And Jerry Reese, who drafted me and gave me the opportunity to be a part of this organization. “I want to apologize to Giants fans. They want to be proud of us, and proud of players like me who represent their team. What happened the other day was embarrassing to them and embarrassing to me. NYG P Brad Wing said CAR's Marcus Ball told OBJ during stretch: "I'll be the reason this will be your last game." Ball had bat on hand. I'm told more than one CAR player reached out to Odell Beckham Jr with supportive texts since Sunday's game ended. As reported yesterday, the New York Giants have placed fullback/defensive tackle Nikita Whitlock on season-ending Injured Reserve with a knee injury that he suffered against the Carolina Panthers last Sunday. To fill the roster vacancy, the Giants have re-signed safety Brandon Meriweather, who was released by the Giants last week when the team signed defensive tackle Barry Cofield. The Giants signed Meriweather in August 2015 after injuries hit the safety position hard. Meriweather was originally drafted in the 1st round of the 2007 NFL Draft by the New England Patriots. He has played with the Patriots (2007-10), Chicago Bears (2011), and Washington Redskins (2012-14). Meriweather started the first 11 games of this season for the Giants until a knee injury kept him out of two games in December. He accrued 53 tackles, 7 pass defenses, and 2 interceptions. Wide receiver Odell Beckham has been voted to the Pro Bowl by coaches, players, and fans for his performance during the 2015 NFL season. 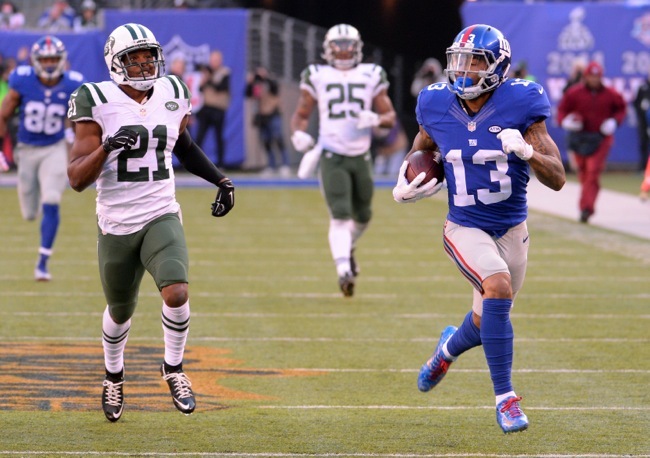 Through 14 games this year, Beckham has caught 91 passes for 1,396 yards and 13 touchdowns. Beckham also made the Pro Bowl his rookie season. 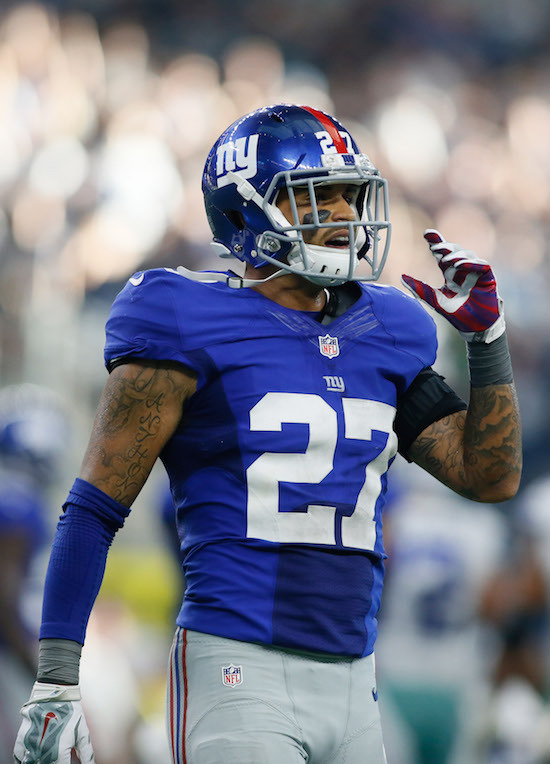 Beckham is the only New York Giant selected to the Pro Bowl. Place kick Josh Brown and return specialist Dwayne Harris were both named as first alternates and will get the opportunity to play if a player at their position cannot participate in the game. WR Dwayne Harris (shoulder), DT Markus Kuhn (knee), LB Devon Kennard (foot), and S Cooper Taylor (concussion) did not practice on Wednesday. RB Orleans Darkwa (illness), DE George Selvie (concussion), and LB James Morris (quad) practiced on a limited basis. The Giants practice on Thursday and hold physical recovery cycles on Friday in advance of Sunday’s away game against the Minnesota Vikings. Though not officially announced yet, the New York Giants have signed former Giant defensive tackle Barry Cofield. To make room for Cofield, the team officially released safety Brandon Meriweather. The 31-year old Cofield was originally drafted in the 4th round of the 2006 NFL Draft by the Giants. He started 78 regular season games in five years in New York, accruing 210 tackles and 10.5 sacks. He signed with the Washington Redskins after the 2010 season and played four seasons in Washington, starting 51 games and accruing 100 tackles and 9 sacks. Cofield missed half of the 2014 season with a high ankle sprain and groin injury and was released by the Redskins in February 2015. In March 2015, he underwent surgery to repair a torn labrum in his hip. Cofield is an average-sized defensive tackle, but he is strong, consistent, and occasionally flashes the ability to penetrate and make plays behind the line of scrimmage. While Cofield is not overly stout at the point-of-attack, he is a better-than-average run defender who fights hard and hustles. Cofield is smart and team-oriented. The Giants signed Meriweather in August 2015 after injuries hit the safety position hard. Meriweather was originally drafted in the 1st round of the 2007 NFL Draft by the New England Patriots. He has played with the Patriots (2007-10), Chicago Bears (2011), and Washington Redskins (2012-14). Meriweather started the first 11 games of this season for the Giants until a knee injury kept him out of the past two games. He accrued 53 tackles, 7 pass defenses, and 2 interceptions. DE George Selvie (concussion), DT Markus Kuhn (knee), and LB Devon Kennard (hamstring/foot) did not practice on Wednesday despite practice being more of a walk-thru. 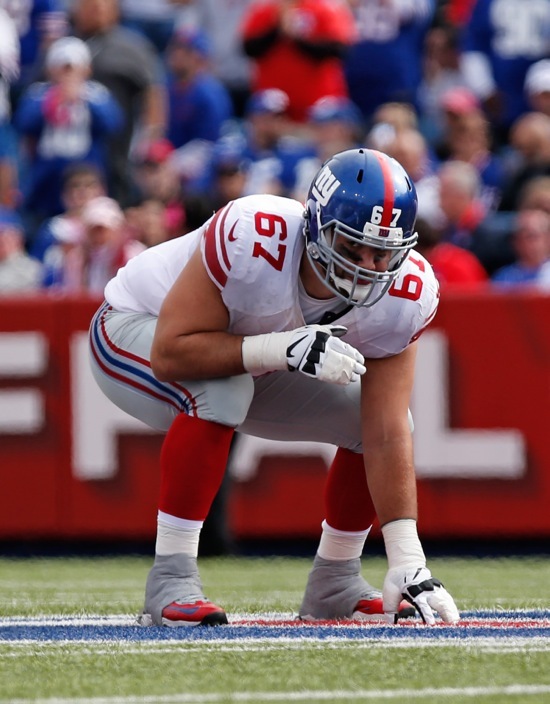 Head Coach Tom Coughlin said Kennard will not play this weekend against the Carolina Panthers. LT Ereck Flowers (ankle) practiced on a limited basis. “I practiced today, I felt good,” said Flowers. “It’s just one of those, after the season, I’ll get it right. There’s no time to (rest), you know what I’m saying.” Flowers said he is playing this weekend despite aggravating his high ankle sprain during Monday’s game against the Dolphins. New York Giants quarterback Eli Manning has been named the “NFC Offensive Player of the Week” for his performance against the Miami Dolphins on Monday night. In that game, Manning completed 27-of-31 passes for 337 yards, four touchdowns, and no interceptions. He had a quarterback rating of 151.5. This is the second time this season that Manning has won the award. The first time was for his performance against the San Francisco 49ers in Week 5. This is Manning’s fourth career “NFC Player of the Week” award. He was also honored in 2006 Week 2 and 2011 Week 3, each for his performance in Giants’ victories in Philadelphia. The audio of Tuesday’s WFAN interviews with QB Eli Manning and RB Shane Vereen are also available at CBS New York’s website. 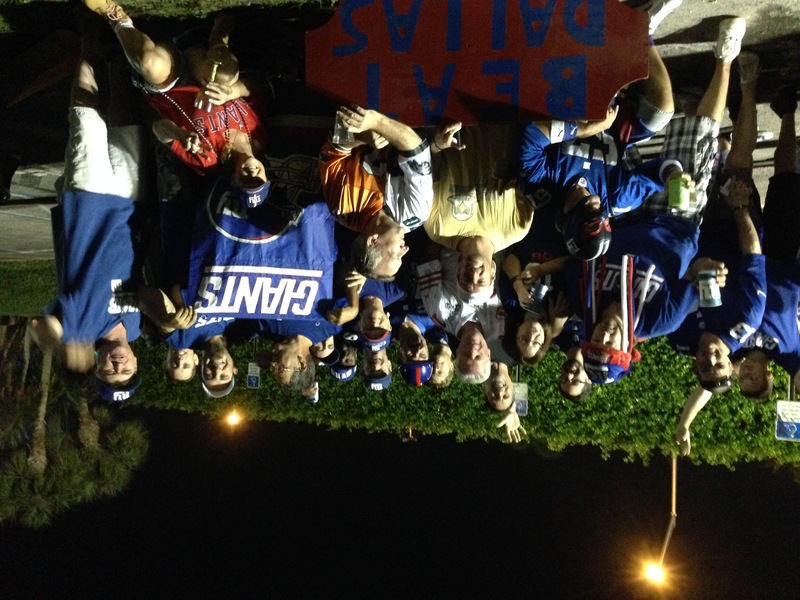 A sights and sounds video from the Giants’ 31-24 win over the Miami Dolphins is now available at Giants.com. 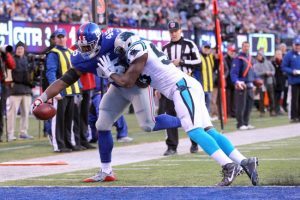 The Giants practice on Thursday and hold physical recovery cycles on Friday in advance of Sunday’s home game against the Carolina Panthers. 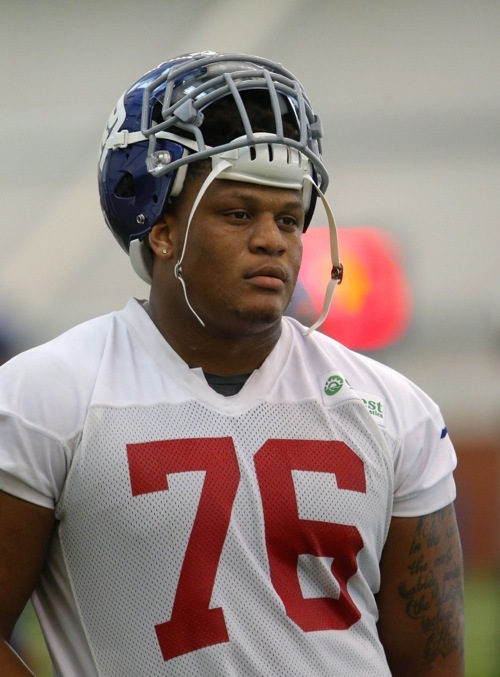 LT Ereck Flowers (ankle) and LB Devon Kennard (hamstring/foot) did not practice on Thursday. Kennard was spotted in the locker room wearing a boot on his right foot. It is unlikely that he will be able to play on Monday against the Miami Dolphins. Flowers appears to be no longer using crutches but may be a longshot to play as well. RT Marshall Newhouse (back) and S Brandon Meriweather (knee) were limited in practice. The Giants practice on Friday and hold physical recovery cycles on Saturday in advance of Monday’s away game against the Miami Dolphins. In pattern far too commonplace this season, the New York Giants lost a heart-breaker, 23-20 in overtime, to the New York Jets on Sunday afternoon at MetLife Stadium. Once again, there was a questionable late-game coaching decision and the team surrendered another double-digit 4th quarter lead. The Giants had a chance to tie the game in overtime but place kicker Josh Brown, who had been perfect all season on field goal attempts, missed from 48 yards out. With the defeat, the Giants fell to 5-7 overall. It was the fifth time this season the Giants have lost a game in the final two minutes – tying a single-season NFL record. Statistically, the Jets out-gained the Giants in first downs (28 to 14), total net yards (463 to 355), net yards rushing (90 to 74), net yards passing (373 to 281), and time of possession (38:31 to 29:56). The Giants were 0-for-3 in red zone opportunities and 4-of-15 (27 percent) on third down opportunities. After both teams went three-and-out and exchanged punts on their first possessions, the Jets went up 3-0 after an 11-play, 78-yard drive that set up a 24-yard field goal. Both teams then gained one first down before having to punt. 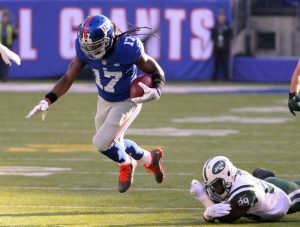 The Giants went ahead 7-3 when wide receiver/returner Dwayne Harris returned a punt 80 yards for a touchdown. The Jets and Giants exchanged punts again. The Giants got the ball back when linebacker Jasper Brinkley forced a fumble that defensive end Jason Pierre-Paul recovered. Despite beginning the possession at the Jets’ 10-yard line, the Giants were forced to settle for a 20-yard field goal by Brown to go up 10-3. Running back Andre Williams was stuffed for a 1-yard loss on 3rd-and-goal from the 1-yard line. The Jets then proceeded to tie the game by driving 79 yards in nine plays, with quarterback Ryan Fitzpatrick hitting running back Bilal Powell for a 25-yard catch-and-run touchdown on 3rd-and-15. 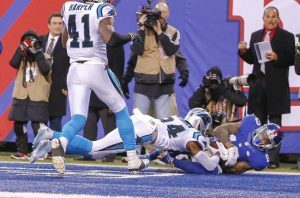 However, the Giants regained the lead on the third snap of their ensuing possession when wide receiver Odell Beckham sprinted for a 72-yard touchdown pass on 3rd-and-2. Giants were now up 17-10. The Giants’ defense forced three-and-out with 1:42 left in the half. The Giants were able gain 50 yards in six pays, primarily on tight end Will Tye’s 45-yard catch-and-run, to set up a successful 35-yard field goal with 30 seconds left. At the half, the Giants led 20-10. Neither team scored in the 3rd quarter. After both teams punted, the Giants began a marathon, 17-play drive that continued midway into the 4th quarter and took an astounding 11 minutes and 21 seconds off of the clock. The turning point in the game came at this moment. Facing a 4th-and-2 from the Jets’ 4-yard line with 8:50 left in the game, Head Coach Tom Coughlin decided to go for it instead of attempting a short field goal that would have put the Giants up by 13 points. Manning’s pass intended for wide receiver Rueben Randle was intercepted and returned to the Jets’ 14-yard line. The Jets then proceeded to cut the score to 20-13 by driving 80 yards in 12 plays to set up a 24-yard field goal with 4:24 left to play. Needing to run some time off of the clock, the Giants could not and were forced to punt after a three-and-out. The Jets started their final drive in regulation at their own 29-yard line with 2:40 left to play. Just like the other five late-game collapses, the defense could not hold. The Jets drove 71 yards in 10 plays to tie the game 20-20. On this drive, the Jets converted on 4th-and-6 when Fitzpatrick scrambled for 15 yards. The game-tying touchdown was a 9-yard pass from to wide receiver Brandon Marshall with 27 seconds left. The Jets won the toss in overtime and drove 61 yards in 13 plays to set up what would be the game-winning 31-yard field goal. Per the new overtime rules, the Giants were given one opportunity to tie or win the game. 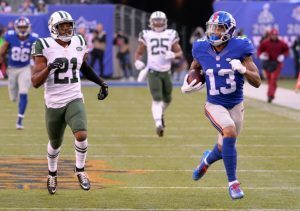 After a 43-yard kickoff return by Harris, the Giants could only pick up one first down on a 4th-and-6 pass to Beckham that gave the Giants the ball at the Jets’ 34-yard line. But the Giants could only gain four more yards before Brown’s 48-yard game-tying field goal attempt. That kick went wide left. Jets had 251 yards of offense in the first 51:10 … Then, starting w/8:50 remaining in regulation, they had 212 yards on last three drives. Offensively, Manning finished the game 18-of-34 for 297 yards, 1 touchdown, and 1 interception. Beckham caught 6 passes for 149 yards and 1 touchdown. No other receiver caught more than three passes and no running back rushed for more than 23 yards. Defensively, while the Giants accrued 3 sacks and 9 quarterback hits, Fitzpatrick completed 36-of-50 passes for 390 yards, 2 touchdowns, and 0 interceptions. Both wide receiver Brandon Marshall (12 catches for 131 yards) and Eric Decker (8 catches for 101 yards) had over 100 yards receiving. Powell also caught 8 passes for 91 yards at running back for the Jets. Left tackle Ereck Flowers was carted off of the field with a left ankle injury in the 3rd quarter and did not return. He was spotted in a boot and on crutches after the game. Inactive for the Giants were TE Larry Donnell (neck), RT Marshall Newhouse (back), LB Devon Kennard (hamstring/foot), S Brandon Meriweather (knee), DE George Selvie, WR Geremy Davis, and OT Emmett Cleary. Rookie Bobby Hart started at right tackle. 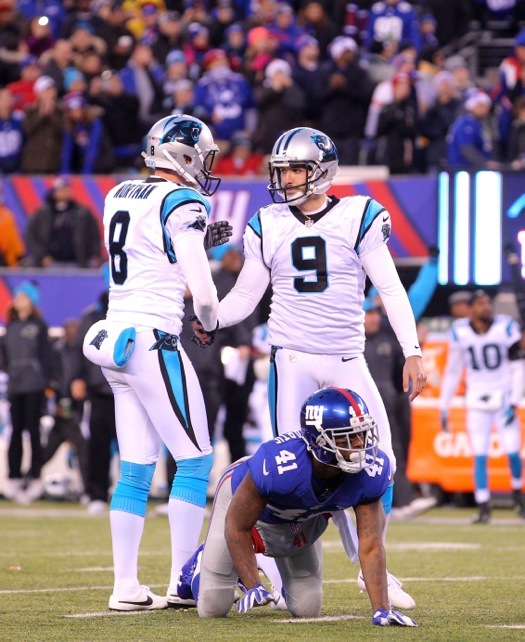 Six of the New York Giants’ seven losses have been by a total of 18 points. This was the third time this season the Giants led by at least 10 points in the fourth quarter and were unable to close out their opponent. Quarterback Eli Manning increased his career yardage total to 43,073. That moved him past Hall of Famer Dan Fouts and into 11th place on the NFL’s career list. Wide receiver Odell Beckham Jr. had his fifth consecutive game with at least 100 receiving yards. He is the first Giants receiver in history to do that in a single season. Beckham has 169 career receptions, the highest total in history by an NFL player in his first two seasons. Beckham has scored 10 touchdowns for the second consecutive season. Wide receiver/returner Dwayne Harris is the third player in Giants’ history with kickoff and punt return touchdowns in the same season, and the first to do it in 60 years. On Saturday, the New York Giants signed linebacker James Morris to the 53-man roster from the Practice Squad. To make room for Morris, the team waived cornerback Leon McFadden. WR Victor Cruz (calf), TE Larry Donnell (neck), LG Justin Pugh (potential concussion protocol), RG Geoff Schwartz (ankle), LB J.T. Thomas (ankle), and LB Uani ‘Unga (neck) did not practice on Wednesday. Donnell began running on the side. Pugh has been experiencing headaches and is being evaluated to determine if needs to undergo the concussion protocol. Schwartz will practice on Thursday. (Late Update: Pugh was examined today by an independent neurologist, and the conclusion from that exam is that Pugh is suffering from the effects of dehydration/heat, not a concussion). 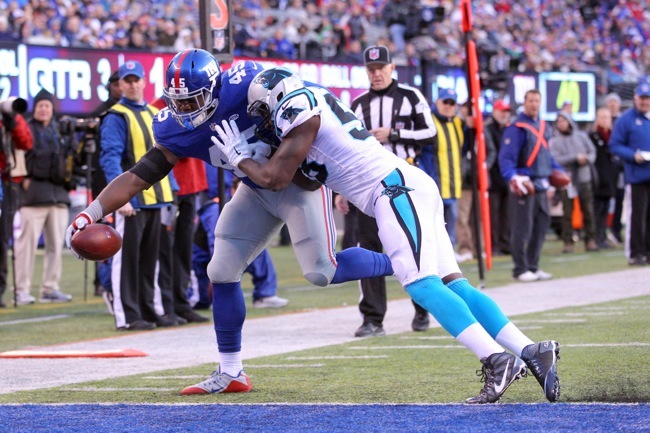 CB Prince Amukamara (pectoral) practiced on a limited basis without contact. CB Leon McFadden (groin) was also limited. OT Will Beatty (pectoral – PUP) continued to work on an undisclosed basis. New York Giants place kicker Josh Brown has been named the “NFC Special Teams Player of the Week” for his performance against the Tampa Bay Buccaneers last Sunday. 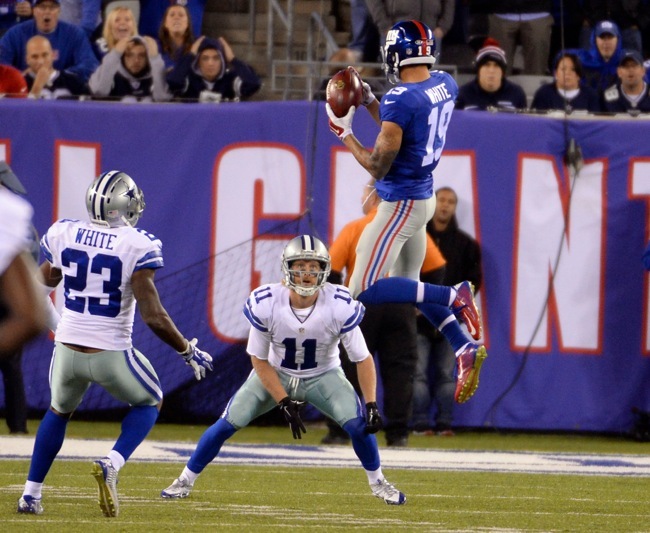 Brown made all four of his field goal attempts – from 35, 35, 53, and 44 yards – in the Giants’ 32-18 victory. The 53-yarder was his longest field goal of the season. Brown is the second Giant to win this award in three weeks as Dwayne Harris won it for his performance against the Dallas Cowboys in Week 7. 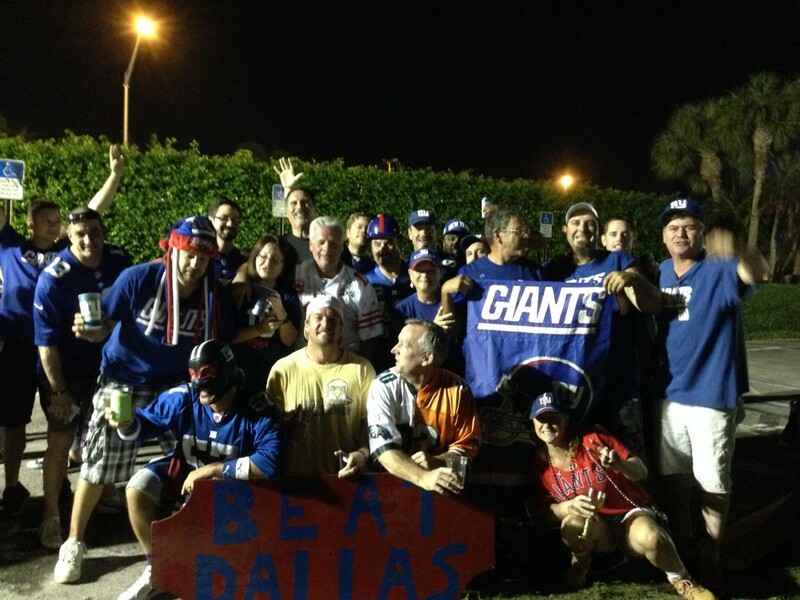 A sights and sounds video from the Giants’ 32-18 victory over the Tampa Bay Buccaneers is now available at Giants.com. The Giants practice on Thursday and hold physical recovery cycles on Friday in advance of Sunday’s home game against the New England Patriots.